Weighing 27.62 carats, the Star of Bharany Ruby is one of the world’s largest and finest star rubies to ever be set as a ring. This stone is renowned for its great color and well-defined star pattern. The renowned Indian gem dealing dynasty, House of Bharany, held the stone in their private reserve for an undisclosed number of years possibly spanning three generations. The Bharany family was very hush about how they came to be in possession of this world class stone and allude to the fact that it is a wonder it was not taken from India during the years under British rule. 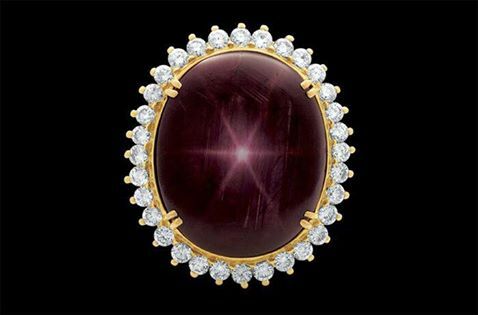 Before being acquired for the Louis XV’s World Famous Gem collection, the House of Bharany set the stone in a 18K gold ring, surrounding the Star Ruby with brilliant diamonds, worthy of the stone and the Bharany Gem Dynasty. Create Your sapphire engagement ring with Sumuduni Gems.Lowest Price. Highest Quality.. This entry was posted in Gem Education|Sumuduni Gems. Bookmark the permalink.